Used for maybe two nights. Turns out I sleep cold even in the summer. The new 850 Down Sleeping Bagan elegant, real-world bag, built with the best materials available and 45 years of down-construction expertise. 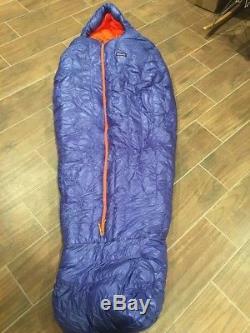 Forty-five years ago, discouraged with the performance of existing sleeping bags, Yvon Chouinard built a mummy-style bag with overstuffed channels and a center-front zipper so he could tie in at belays, cook at bivies, move around without the bag twisting, and have consistent loft trip upon trip. Inspired, we set out to create our own version of Yvons innovative bag. The result is the new 850 Down Sleeping Bagan elegant, real-world bag, built with the best materials available and 45 years of down-construction expertise. We started with ultralight 100% nylon ripstop Pertex Quantum® fabric, which features Y-shaped filament technology to create a shell thats nearly half the weight and twice the strength of our other down shell fabrics. The interlocking Y-shaped fibers of this fabric allow maximum down loft, provide superior durability, and enhance the performance of the DWR (durable water repellent) finish. We made the liner from our beloved Houdini® fabrica featherweight 100% nylon ripstop that provides quick dry times and soft, next-to-skin comfort. We insulated the bag with 850-fill-power Traceable Down for exceptional heat-trapping warmth, season after season durability, ultracompressibility, and light weight. Built with a state-of-the-art differential baffle construction, weve eliminated sewn-through seams to banish cold spots and make sure the down stays lofted regardless of your sleep position. Our low-profile hood is designed to move with you and minimize twisting; it fits securely around your shoulders and head with lightweight cording and concealed cord locks. The custom foot box has a fully baffled, differentially cut pattern to eliminate any dead spaces, maximize warmth and allow ample room for movement. Ultralight 100% nylon ripstop Pertex Quantum® fabric, which features Y-shaped filament technology to create a shell thats nearly half the weight and twice the strength of our other down shell fabrics. Liner is made from our beloved Houdini® fabrica featherweight 100% nylon ripstop that provides quick dry times and soft, next-to-skin comfort. 850-fill-power Traceable Down (Goose down traced from parent farm to apparel factory to help ensure the birds that supply it are not force-fed or live-plucked) for exceptional heat-trapping warmth, season after season durability, ultracompressibility. State-of-the-art differential baffle construction eliminates sewn-through seams to banish cold spots and make sure the down stays lofted regardless of your sleep position. Low-profile hood is designed to move with you and minimize twisting; it fits securely around your shoulders and head with lightweight cording and concealed cord locks. When packing, there's an ultralight stuffsack made from our Houdini® fabric (1.2-oz 100% nylon ripstop). For long-term storage, a larger drawstring-bag (made of a 55% hemp/45% organic cotton blend) is included. The item "Patagonia 850 Down Sleeping Bag 19°F / -7°C Short" is in sale since Thursday, August 9, 2018. This item is in the category "Sporting Goods\Outdoor Sports\Camping & Hiking\Outdoor Sleeping Gear\Sleeping Bags". The seller is "vlarivie" and is located in Salt Lake City, Utah. This item can be shipped to United States.